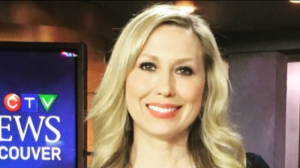 Michele Brunoro is an anchor, reporter and the Fraser Valley Bureau Chief for CTV News Vancouver. Having grown-up listening to her parent’s talk-radio shows, Michele knew from a young age that she wanted a career as a reporter. She grew up in the Valley and completed a Communications degree at Trinity Western University before taking the Journalism program at Langara College. She got her start in the business writing for community newspapers in the Lower Mainland and still believes some of the best stories are found at the community level. She worked as a radio reporter at CKNW and CKWX before moving into television in 1998. Michele has received regional, national and international recognition for her work, including winning an Edward R. Murrow Award in 2006 for a six-part series on crystal meth and three Jack Webster awards, most recently for being a part of a team covering B.C.’s opioid crisis. She’s also proudly worked on issues on homelessness in Metro Vancouver on a CTV News series called Dead End Streets and a drug series called Life or Meth. In her spare time, she loves getting outdoors with her family for hiking, rollerblading, horseback riding or some backyard volleyball.